Files are Ontology Web Language in TTL (turtle) notation. The base directory is https://finregont.com/fro/ Below is a list of Ontology files in this site. Just right-click on the filename to download or copy the link into your ontology editor. 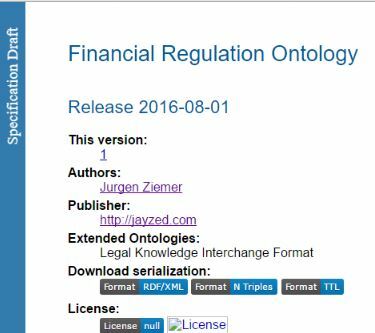 Financial Regulation Ontologies for XBRL and Eurofiling have separate directories here. The SPIN directory has additional modules for licensed users (password required). ./ The base directory contains configuration files to include a scope of FinRegOnt for a specific purpose. FRO_Banking.ttl FRO_Banking A simple include of CFR and USC Banking. ref/ The reference directory contains modules with top-level classes for Legal and Finance and manages external ontology imports. AnnotationProperty.ttl : A minimalistic set of OLW Annotation Properties. FIBO_EthOn_Alignment.ttl fibo-ethon-align The ontology alignment creates OWL axioms of equivalency and class subsumption. FIBO_LKIF_Alignment.ttl fibo-lkif-align Ontology Alignment of Financial Industry Business Ontology (FIBO) and Legal Knowledge Interchange Format (LKIF). LLC_import.ttl : The ontology imports ISO Country and Language codes from OMG. Reference.ttl fro-ref Reference concepts common to both Legal and Finance. US_LegalReference.ttl fro-us-leg-ref Extension to Legal Reference specific to the USA. This ontology module has instances for US regulatory agents like SEC, FED and lawmakers. cfr/ The CFR directory has files in support of the US Code of Federal Regulations. 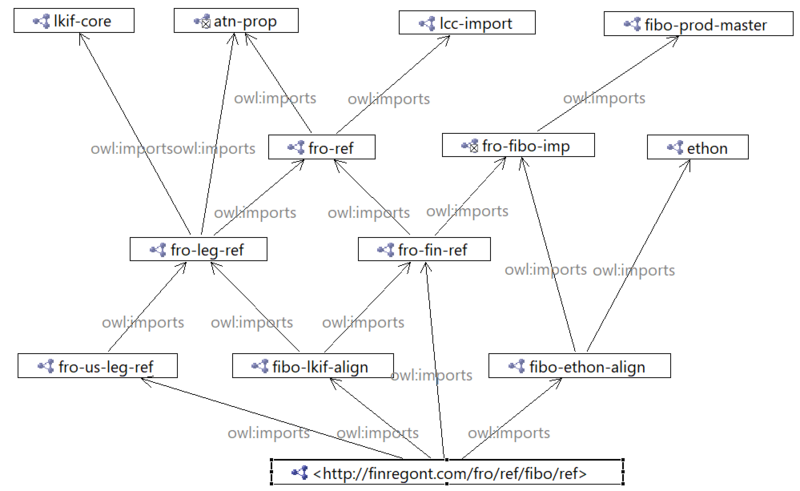 Ontology modules starting with “CFR” are the RDF/OWL Staging representation. Modules starting “FRO_CFR” have the text of the regulation loaded into Financial Regulation Ontology classes. CFR_FDSys_Schema.ttl cfr-fdsys-s An OWL representation of the Government Publishing Office (GPS), Code of Federal Regulations XML schema. Code_Federal_Regulations.ttl fro-cfr The ontology model for the US Code of Federal Regulations. It has the ontology target classes for Part, Volume, Title, Section, Chapter, and Paragraph. FRO_CFR_Banking.ttl : A simple include of the relevant FRO files for Code of Federal Regulations Part 217, 225 and 252. FRO_CFR_Title_12_Part_217.ttl fro-cfr-t12-p217 The data triples in this ontology instantiate FinRegOnt classes CFR_Title, CFR_Section, CFR_Paragraph etc. along with their properties. They are loaded from CFR-2015-title12-vol3-part217, reverse engineered from the original data in Government Publishing Office XML file. FRO_CFR_Title_12_Part_225.ttl fro-cfr-t12-p225 The resources in this ontology instantiate FinRegOnt classes CFR_Title, CFR_Section, CFR_Paragraph etc. along with their properties. They are loaded from CFR-2015-title12-vol3-part225, reverse engineered from the original the original data in Government Publishing Office XML file. FRO_CFR_Title_12_Part_252.ttl fro-cfr-t12-p252 The resources in this ontology instantiate FinRegOnt classes CFR_Title, CFR_Section, CFR_Paragraph etc. along with their properties. They are loaded from CFR-2015-title12-vol3-part225, reverse engineered from the original the original data in Government Publishing Office XML file. FRO_CFR_Title_17_Part_275.ttl fro-cfr-t17-p275 The data triples in this ontology instantiate FinRegOnt classes USC_Title, USC_Chapter, USC_Paragraph etc. along with their properties. They are loaded from CFR-2015-title17-vol3-part275, reverse engineered from the original data in Government Publishing Office XML file. usc/ The USC directory contains all files for the United States Code. Filenames starting “USC_” indicate RDF/OWL renditions of Staging, the original XSD source. Filenames starting “FRO_USC” are target instances for Financial Regulation Ontology classes. United_States_Code.ttl fro-usc An Ontology schema of the Unites States Code (USC). FRO_USC_Banking.ttl : A simple import of the relevant FRO files for United States Code Title 12 Chapter 17 and 53. FRO_USC_Title_12_Chapter_17.ttl fro-usc-t12-ch17 The data triples in this ontology instantiate FinRegOnt classes USC_Title, USC_Chapter, USC_Paragraph etc. along with their properties. They are loaded from USC-2015-title12-chapter17, reverse engineered from the original data in Office of the Law Revision Counsel XML file. USC-2015-title15-chapter2D.ttl fro-usc-t15-ch2D The data triples in this ontology instantiate FinRegOnt classes USC_Title, USC_Chapter, USC_Paragraph etc. along with their properties. They are loaded from USC-2015-title15-chapter2D, reverse engineered from the original data in Office of the Law Revision Counsel XML file.